First-time homebuyer mortgages have a history of performing worse than repeat homebuyer mortgages, according to a FHFA working paper written by Saty Patrabansh, The Marginal Effect of First-Time Homebuyer Status on Mortgage Default and Prepayment. Earlier studies regarding first-time homebuyers focused on FHA mortgages, but this paper was based on data from Fannie Mae and Freddie Mac. 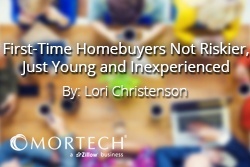 Compared with repeat homebuyers, first-time homebuyers tend to be unmarried and younger with lower credit scores and higher loan-to-value ratios. The loan terms tended to be longer with a preference for fixed-rate mortgages. According to data in 2012, the properties they purchased were worth $50,000 less than repeat homebuyers and tended to be condominiums, not single family homes or in Planned Unit Developments. First-time homebuyers are also less likely to prepay their mortgages. With these inherent differences, the first-time homebuyer is somewhat weaker than the repeat homebuyer and may be less able to weather financial hardship. However, when put into an econometric model, there is little difference between the groups in terms of loan performance. This shows that the weakness is caused by a difference in the distributional make-up of the groups rather than first-time homebuyers being an inherently riskier group. We look at industry happenings and updates every week. Over the last few weeks we've been writing on the CFPB's proposed delays to TRID, which you can catch up on here.